Air Fryers, the magic counter top machines that simulate frying without immersing foods in oil, have been popular for long enough that today’s customers are looking for special features. For a while, later models just kept getting bigger, overlooking the part of the market that wants a petite and cost effective model. Enter the Gourmia GAF 355, a tiny, bare bones model with an excellent price point. Gourmia is a popular brand that is well established with a younger market. They are known for forward thinking and innovative designs. While not the very oldest brand on the market, Gourmia has been around long enough to become a trusted name and achieve a great deal of popularity. The Gourmia doesn’t come with any extra pots or pans but it includes an extensive user manual as well as a cookbook. The Gourmia GAF 355 has a 2.2 quart capacity and comes in black. We weren’t able to specify the exact size but the shipping weight is 7.3 lbs, comparable to a large toaster. The Power specifications are 120V, 60Hz, and 1000 Watts. The cooking capacity of this little machine is 2.2 quarts, meaning that 2 chicken breasts, a few spring rolls, a steak or a cupful or fries will fit in it. The temperature goes up to 400 degrees and the timer runs for 30 minutes. This should be more than enough for cooking a small batch but as a cool down time is required, so multiple batches may be impractical. The basket is a single, slide in piece that clicks into place. The GAF 355 also has a removable pan, made for drips, not cooking. Both units are hand washable and non-stick, so nonabrasive materials should be used for cleaning them. Without sounding like a Zen master, the Gourmia GAF 355’s major feature is it’s lack of features and diminutive size and price. Truly small, inexpensive, and simple, the GAF 355 speaks to customers that want exactly that, whether it is because they are students, singles, seniors, or simply want to try air frying without making a substantial investment. Nonetheless, like all Gourmia products the build is solid. The GAF 355 speaks to people who appreciate simplicity. Gourmia also makes larger, digital air fryers but that is not the audience to which the GAF 355 appeals. This air fryer is for the person who wants a simple, economical machine that will get them where they want to go. In some cases, the GAF 355 might be suited for couples but it is not designed to be a family, or party, machine. The Gourmia is not dishwasher safe, although it is coated with nonstick coating, and it comes with no accessories. As you can use conventional oven cookware in an air fryer you might be able to fit a small mug in it, for example, for cooking soup or a mug cake. Review skim readers alert! The Gourmia GAF 355 is a terrific little machine precisely because of what it doesn’t do. If you or your family want fancy, or big, you won’t find it here. But if you are a retiree or grad student and just want some simple air fried meals it is perfect. We loved a customer review from a retiree with health issues that forbade eating fat who said that this little machine had changed his life. The warranty is one year and covers anything that goes wrong that couldn’t have been prevented by following the manual precisely. As a note, we called the company to find out about this, as Amazon and Gourmia don’t have copies of the warranty available online, which is surprising as the warranty is more comprehensive than that of many air fryers. Gourmia support was responsive and helpful. This is a manual air fryer and in general a ‘bare bones’ model. The GAF 355 is small enough for any space. This Gourmia model has a great warranty and an excellent price point. Should I Buy the Gourmia GAF355? We love this little machine because of everything it isn’t. You can benefit from an air fryer without needing to, or wanting to, ‘go Cadillac’, and with a dependable brand and a good warranty behind it, we think the Gourmia GAF 355 is an excellent choice for someone looking for a small and compact air fryer without breaking the bank. 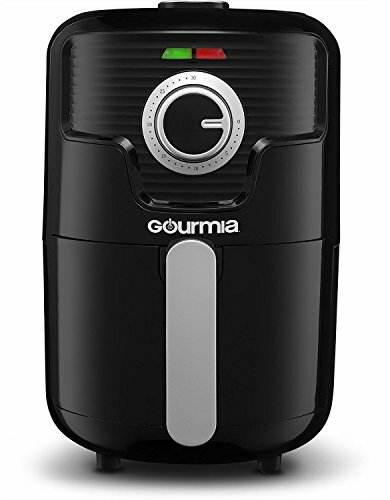 If you own this Gourmia Air Fryer we’d love to hear from you. Share your experience with this airfryer model below.